The great bulk of seals taken annually in the Gulf of St. Lawrence and off the eastern coasts of Newfoundland and Labrador - known as 'The Front' - are Greenland seals, or harps. These are gregarious creatures which migrate on a regular pattern. The northwest Atlantic herd summers in Baffin Bay, and in the fall begin to travel south along the Labrador coast. Reaching the Strait of Belle Isle by late December, some move into the Gulf and others towards the Grand Banks. In February the seals find ice on which the females can give birth. The Gulf herd usually whelps off the Magdalen Islands. The Atlantic herd moves north to meet the ice drifting south along the coast of south Labrador and northeastern Newfoundland. Here the young are born in large patches. The pups weigh about 15 pounds at birth, and have a yellowish coat, that soon turns white. They rapidly put on weight, reaching 60 to 70 pounds in 16 to 18 days. At this stage they are considered to be in prime condition. The white coat is soon shed - during the moult they are known as 'raggedy jackets' - and the pups lose weight. When independent of their mothers they take to the water, and are known as 'beaters'. Year-old harps are called 'bedlamers'. Once the adult seals have themselves moulted, and then mated, the herd begins its journey back to the Arctic. Harp seal pups are also known as Whitecoats, named for their fuzzy white “coat” of hair which is shed within three weeks of birth. Reproduced by permission of Fred Bruemmer. Photo ©1974. 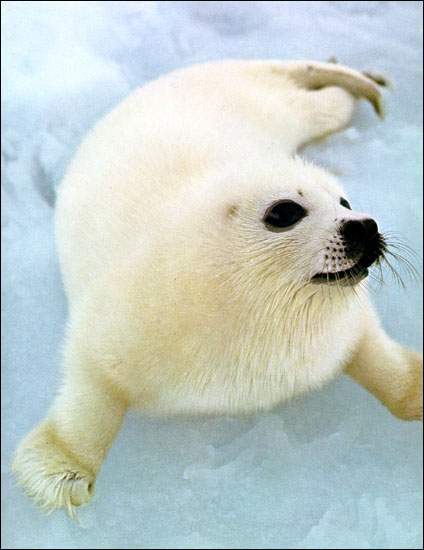 From Fred Bruemmer, The Life of the Harp Seal (Montreal: Optimum Publishing Company, ©1977) 20. There are other types of seals in Newfoundland and Labrador waters, among them the hooded seal, the square flipper and the harbour seal. The skin of the harbour seal was prized for clothing, which made it particularly valuable. The large square flippers's fat was good for oil. But none of these seals could be taken in the same quantities as harps since they are more dispersed and do not gather on the ice for whelping. Because the harps migrate annually close to the coast, and then congregate on the spring ice, they were far more easily accessible to people on the coast. The first people to harvest seals were, of course, the Aboriginal peoples. All of the Aboriginal cultures which lived in Newfoundland and Labrador before and after contact with Europeans relied on seals to a greater or lesser extent. To the Labrador Inuit in particular, the seal was until recently a staple component of a way of life largely adapted to local resources. The meat was eaten or fed to the dogs; the fat was rendered into oil for light and food; the skin was used for clothing, boots and a myriad of other purposes besides trade with European merchants. Settlers from Europe viewed the seal quite differently, apart from those in Labrador who adopted Inuit ways. Never adapting to the environment like the Aboriginal peoples, they viewed the seal as a commercial article to be sold for the goods which the Natives would have manufactured from it. Seal meat never became an important part of the Newfoundland diet except in a few localities, though the flippers were prized as a seasonal delicacy. The skins were not widely used for clothing. Small articles were made in some localities, boots perhaps, mitts and caps, but only the plutocrats of St. John's wore sealskin coats. Settlers caught the seals because they needed income, not because they used them in everyday life, and merchants were anxious to buy skins and the fat. When the commercial seal fishery began in 18th century Newfoundland and Labrador, the catch consisted overwhelmingly of adult seals, taken from the shore in three ways. The first, and most important method, was the use of nets to intercept the seals on their migrations. These were heavy, strong affairs, but not expensive to acquire, and were used extensively wherever seals passed close to shore. They were most commonly found on the south Labrador coast, the straits of Belle Isle, and the Newfoundland coast north of Twillingate. To the south of Notre Dame Bay their use was less common, but by no means unusual. The other methods were less efficient since they depended to a greater extent on chance. If the wind blew the whelping ice close to land, men could walk out to look for seals and drag the pelts back. Another method was to use small boats to hunt seals, keeping relatively close to land. These two methods are covered by the term 'landsmen fishery'. This northern industry was a vital part of the annual round, and a very important factor in the growth and dispersal of settlement in northeastern Newfoundland. The summer cod fishery remained the staple industry, but year-round occupation depended upon the exploitation of other resources. Crews left behind for the winter exploited not only seals, but also trapped furs and fished salmon in early summer. 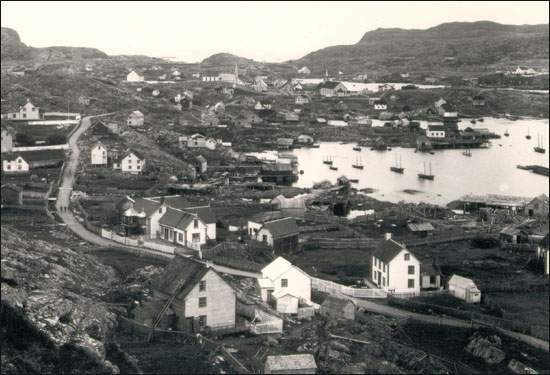 From these crews developed the permanent population of northern Newfoundland, and important sealing centres such as Fogo, Greenspond and Bonavista began to emerge. Fogo was one of the important sealing centres on the island of Newfoundland. Courtesy of Archives and Special Collections (Coll - 137, 13.13.001), Queen Elizabeth II Library, Memorial University of Newfoundland, St. John's, NL. Towards the end of the 18th century, southeastern Newfoundland became attracted to the obviously lucrative seal fishery. The Avalon Peninsula was off the route of the seal migrations, and the spring ice drove in the seals all too seldom. The only way to participate was to travel north and find the seals. Thus in 1793 the first schooners sailed to the ice from St. John's. They were small, about 45 tons, but successful. This expedition marked the beginning of the characteristic Newfoundland seal fishery, the taking of seals from vessels which sailed into the ice to seek actively for seals young and old. It was to last for almost 200 years. For other related articles view the Economy Table of Contents Fisheries section.